The Difference between "Priests and Prophets" and Sins and "Failures"
What we have gone out to see, as in the days of John, was a priest and a prophet — we have looked and have found neither. Not a priest of God, not a prophet of God — but most often a priest of men and a prophet of the world. 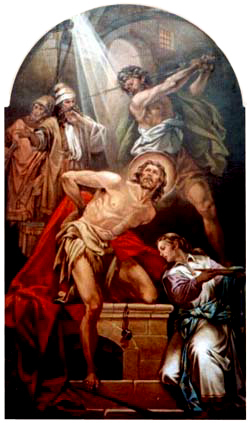 Saint John the Baptist was, in a sense, the prototypical Priest of the New Covenant, a Priest of God, a Prophet of God, not in the raiment of the world, but clothed as one on a mission and set apart by God for His people. He did not compromise with the world, nor did he compromise with Herod. We have gone out to see ... Christ! — and we do not find Him. But still we stay, for we know He is hidden, not only remotely in the priest, but most especially under the appearances of bread and wine, in the Most Holy Sacrament of the Altar. We believe. So we stay. Not because of the priest, but in a tragic paradox, despite him. Why are priests so afraid of, so reluctant to use, the word SIN? Unlike John, how often our priests invite us to “take a moment to call to mind our faults and failings” ... but not our sins! I fail in many ways during the day, and I have countless faults ... my employer can enumerate them, my spouse can clearly point them out, my children may often remind me of them ... but none of them, not one, is a sin. Are the words, then, interchangeable? Are they tautologies? Do they mean the same thing? Are faults the same as sins? Are failures sinful? In both scenarios you will likely find people looking at you in astonishment. They will tell you that your utterance is not simply odd, but really out of context, out of place, inappropriate; that your fault or failure had nothing whatever to do with God and sin. They may also suggest a good therapist ... Certainly they will look at you askance and make a mental note to avoid you in the future. Who will tell our Priests? No! He called them in no uncertain terms to repent of their sins! Did he accuse Herod in his adultery of being at fault ... of failing? Or did he accuse him of sin? Herod made no mistake about it, and had John’s head for it! Why have we found it so expedient to have so many euphemisms for sin? Why are we reluctant to speak of it in no other terms? Why are we so solicitous of the sensitivities of men — and so hardened against the pronouncements of God Himself? It is not simply an odd state of affairs; it is a scandalous state of affairs! Sin has largely become distributive, something social, and not personal. It is politely reduced to a mere solecism of sorts, and not an affront to God. It is subtly redefined into something for which there is no real personal accountability before God; it does not attain to a sense of our own, unique and personal responsibility. It is the sin “of the world”, sin inherent in the anonymous “structure of society” ... which then becomes far less my own sin. Our personal complicity in sin is absolved – just as our own unique identity is an aside to, evanesces in, the notion itself of “society”, and “the world”. It is, oddly, a whole which is less than, and not equal to, the the sum of its parts. We are clever. We know that if we indict the whole world, we indict no one. This was the rabble that called for the crucifixion of Christ. The “people” demand His crucifixion, and therefore no individual is guilty of it. Despite public lamentations from the pulpit, there is no “collective sin”. There is the sin of men, and each is complicit in the crime — and each responsible for it! We want to hear John because we want to be told of sin — for we know it, and we recognize our personal complicity in it! And we seek deliverance from it! When wolves come in sheep-skins and tell us that what we know to be inescapably true – true of us, and therefore likely true of the rest of mankind – is not true, or is something other than we know it to be, we turn away. This is the evangel of the world. We hear it day in and day out. And we know it is false. This is not why we came out, this is not what we came to see, to hear — at Church ... at the foot of the Cross during the most Holy Sacrifice of the Mass. So often it seems that not only has “the world” either forgotten or discarded the notion of sin – but that our very Priests have as well ... in a deeply misguided attempt to console us, to assuage our consciences — rather than save our souls. But that is not what John was sent to do. The wilderness is all about us. Where is the voice crying out within it?